Are you looking for a sweet and original gift for your mother? Her birthday because she's always ready for you or just because she's the dearest mother? Then choose for a jewel, the 'always-good gift' for each mother. Certainly if you engrave child names or birth dates, or the jewelry gives meaning to our Swarovski® birthstones. This gift you really wanted for her, sure that this will be in the taste of every mother. Beautiful sterling silver jasseron bracelet that you can personalize to fit your needs. 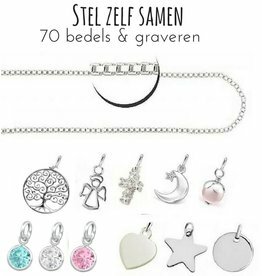 We can also engrave the charms for a persoonlijkie touch. Beautiful door-and-door silver charms for a chain or bracelet. We deliver the beads with a 5 mm or 7 mm eyelet so that you can hang it on a bracelet or chain. Beautiful sterling silver necklace that you can personalize to fit your needs. We can also engrave the charms for a personal touch. Beautiful bangle that you can engrave yourself in the text you want! 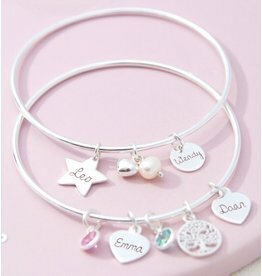 Make the bracelet extra special by adding an inside engraving. The perfect gift for moms, daughters or sisters! Beautiful necklace with three sterling silver rings that we took, data or rhetoric can engrave. How to wear them close to your heart! Including necklace and free shipping. This pendant has as many as 3 circles where you can engrave names, dates, or special words. Including solid silver necklace. Finish your outfit with this sturdy bracelet made of stainless steel. 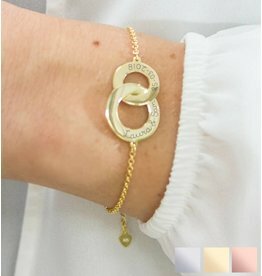 The bracelet has space for an engraving of up to 20 characters and fits through the oval shape perfectly around the wrist. A bracelet that can not be missed in your collection! These through-and-through silver bracelet is a perfect gift, especially since you can engrave the front and the back. Dear heart speaks for itself! Gorgeous .925 silver bracelet with an attached silver graveerbedel (first name, word or date). The heart and the pearl symbolize pure love. At the back there are many beautiful texts (or a letter) to choose from. Beautiful tough bracelet in 'Tiffany Style'. Choose from .925 sterling silver or Rosé gold gilded. 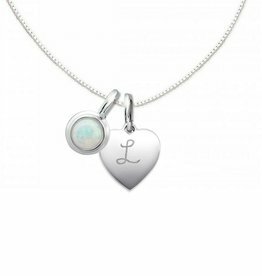 The silver engraving bed (name, date or word) and freshwater pearl + small silver heart are even more personal! Beautiful door-and-door silver ring containing 3 birth stones and place for the names of your kids. Adding an inside engraving makes the ring extra unique and personal. A great way to carry your family close to you! Brilliant chain having thereon a graveerbedel (1cm) and beautiful pearl gloss freshwater. We engrave either a name, word or date. Superb .925 silver necklace with an engraving disc and Swarovski® birth crystals. We engrave an initial or figure of your choice and complete it with a beautiful crystal that refers to the month of birth. Brilliant chain with a graveerbedel thereto in the form of a cut-away heart. Both are engravable are, for example, 2 children's names, a name + a date, or something else. Treat your mother with an original gift that you have chosen for her. You do not have to worry too much about yourself; We have listed the most popular gifts for mom. For example, give a mother's jewelery engraving and create a gift invaluable. KAYA really makes silver mother presents with names, words or special dates. At KAYA you can personalize silver jewelry with child names, words or special dates. Piece made of the most beautiful materials such as sterling silver and Swarovski (birth) crystals. The love for your children enclosed in a special ornament, how beautiful is that? KAYA makes many gifts that they will wear proudly and will cherish forever as a reminder at an important moment. KAYA sells mother chains, name tags, birth hangers and more mother jewelry for a cheaper price than the jeweler. Why? Because we do not rent a store, do not advertise and do not employ any staff. 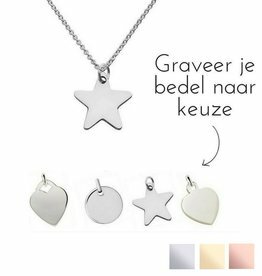 For our mommy jewelry work with a engraver with more than 10 years experience who is a supplier of many juwliers in the Netherlands and Belgium. Equal quality for a much lower price so. All mother jewelry is made of Sterling Silver, lock, charm to pendant. This mamakado is a whole lifetime. Mommy carries her loved ones near ... forever! Mother are you forever, and are often underestimated, Numerous sleepless nights, night foods and small crashes, it all belongs. Therefore treat your mother with a special piece of jewelry to show that your hair greatly appreciates. With such a mother's gift shows you what she means for you, and can wear her every day close to her to seal your love. Mom & me bracelets sets, too sweet! A popular item of KAYA are the mother and daughter bracelets sets, super sweet to gift. With the wide range, there is always a good deal of convenience. For sweet mom & me bracelets, make a set of the most beautiful freshwater pearls, or choose a silver bracelet set, a timeless ornament. Extra fun: Every mom & me bracelets set comes in a sweet gift box + gift card 'The love between mother and daughter is forever!'. A little extra, which makes the bracelets more fun to give!